If it’s about transportation or transit, it’s here. As part of the Downtown Plan update due this year, the City of Spokane has contracted with Nelson\Nygaard to conduct a comprehensive study of parking options and usability in downtown Spokane and the University District, evaluating at a deep level how people travel downtown, the incentives they receive or don’t receive, and potential future improvements to the user experience. The survey is now live, and we encourage readers to take it. North Monroe might just be Spokane’s coolest urban district. It’s about to get even cooler. North Monroe might just be the coolest urban district in Spokane. In addition to the abundance of hip shops, restaurants, and bars which have recently opened or relocated to the area, which stitches together the Emerson-Garfield Neighborhood, the corridor has for many years played host to one of the best collections of antique and vintage shops in Washington State. Between Boulevard Mercantile, Tossed & Found, 1889 Salvage Co., and many others, thrift shoppers and vintage enthusiasts have an abundance of options and opportunities to search for hidden treasures. In recent years, the district has also added a number of boutique retail and other shops, like Brickyard Barbershop and Kingsley & Scout. But the real magic of North Monroe might not even be the craft coffee at Vessel Coffee Roasting, the craft beer at Bellwether, or the food at Prohibition. No, the real magic of North Monroe lies in its inherent contradictions. Like Spokane, it lies at the bleeding edge between the positively mundane and the relentlessly urban. Not content to pick just one, it embraces the past, present, and future all at once, playing host to vintage shops, craft coffee roasters and breweries, and the creative, positive Urban Art Co-Op. The district reflects the polarized nature of our city and our nation, as typified by both the aggressive, hostile signs seen in the windows businesses like Azar’s and the warm, welcoming spirit of the North Monroe Business District social media presence, which attempts to support all businesses in the area––not just the ones with which they agree. Like Spokane, North Monroe has one foot in each camp of the new urban divide, constantly questioning what it wants to become, while simultaneously exuding everything that’s hip, cool, artsy, and entrepreneurial about the city. That might just make North Monroe our most interesting, coolest urban district in one of the coolest neighborhoods—Emerson-Garfield. And now, thanks to the leadership of numerous highly-dedicated area residents, city staff, and our elected officials, this urban district is about to get a lot more attractive. 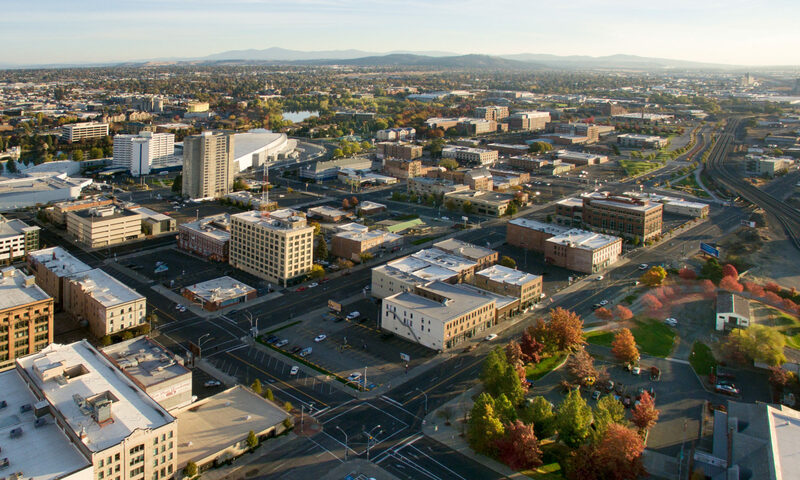 The City of Spokane has announced that the North Monroe redevelopment will be moving forward as planned, with construction beginning in spring 2018. The project, which will add various pedestrian- and business-friendly features, such as wider sidewalks, curb bulb-outs, enhanced and widened parking, street trees, among other amenities, would create the opportunity for the district to evolve into an urban neighborhood on par with South Perry, Garland, or West Broadway. In addition, it will widen the traffic lanes while narrowing the street as a whole, going from four to three lanes total and making driving a more hassle-free experience. Taken together, these types of traffic improvements induce visitors to stay longer, spend more, and return more often. And stay more safe! For a vibrant urban district like North Monroe, that’s huge––and it will greatly benefit local business owners. In the meantime, it will be critical for agencies and organizations like the City of Spokane, Spokane Transit, Avista, and all of the others which will be performing work associated with this project to perform broad, intentional outreach to affected business owners. Construction can take a significant toll on businesses, and it’s now on project supporters to prove that this is the right investment for the right time in Spokane history. The North Monroe Business District will also be performing outreach, and we encourage readers of this blog to patronize the affected businesses––even those which oppose this project––over the course of construction. In addition, the City of Spokane should consider including a generous bonus in the construction contract for an early completion. This would entice the general contractors to speed up work––potentially even by working through nights and weekends––to complete the project has quickly as possible, minimizing impact on the businesses and organizations along the corridor. In the end, though, North Monroe will certainly be better off for it. The coolest urban district in Spokane will become immeasurably cooler, and the businesses along the corridor will be the primary beneficiaries of easier access, increased and friendlier parking, and a more walkable urban environment that invites residents to participate in the community, rather than stay in their homes and cars. North Monroe may even surpass South Perry or Garland as a “destination neighborhood.” But even if it doesn’t, the Emerson-Garfield Neighborhood, the community, and the city will all gain. I am super excited to walk down North Monroe, grab a coffee at Vessel, keep wandering down the street through the local thrift and vintage shops, like Boulevard Mercantile, then finish with Happy Hour at Prohibition or Bellwether. And I hope you all are too. COMING UP: This weekend, join neighborhood residents, community groups, and local nonprofits to brighten up and improve the North Monroe area at Cleaning from the Corridor. A number of teams will be volunteering in the district, and it gives you an opportunity to meet local business owners and community leaders as you improve the neighborhood. Find more information at the link above. SHARE YOUR THOUGHTS: What do you think? Is North Monroe the coolest neighborhood in Spokane? What’s your favorite business or restaurant in the district, and why? Are you excited about the planned revitalization and reconstruction of the street? And would you invest in the corridor, given the opportunity? Share your thoughts on Facebook, on Twitter, in the comments below, or in person. We love to hear from you! The Central City Line will make use of modern electric buses like the VanHool ExquiCity, which is already quite popular in Europe. Ours could be one of the first installations in the United States. If you live in the Spokane area, Proposition 1 is the most important measure on your ballot this year. By funding the STA Moving Forward plan, the measure will expand regional transit services by adding the first high-frequency bus rapid transit routes, several new transit centers, and late-night service on multiple lines. In addition, it will provide the necessary funding to maintain existing service levels. But lost in the noise has been an honest conversation about what exactly the measure will do. So let’s break it down. Across the country, bikeshare systems are adding to the array of multimodal and diverse public transportation choices while allowing an opportunity for private companies and vendors to capture a new market. In addition, these bicycle rental and subscription services can help to build new urban spaces, diverse and innovative squares, and centers for public life. Even a simple intersection can become a “place,” if enhanced with a bike station, benches, and perhaps curb bulb-outs or other streetscape enhancements. It’s time for Spokane to join these cities. Imagine the potential of a bikeshare system with stations in Browne’s Addition, the University District, near Gonzaga University, on Hamilton, in the Garland District, in the South Perry, and in multiple locations downtown. Imagine the potential of being able to grab a bike downtown and ride to grab a pizza at the Elk in Browne’s Addition, then take a Spokane Transit bus home. Imagine the potential of riding from the Garland District to Kendall Yards, and never having to worry about finding a bike rack or carrying a lock. Instead, you can just drop the bike at a station. And bikeshare would take advantage of our growing bicycle infrastructure in Spokane, including added bike lanes on Main Avenue and other area roads and streets. It could help to grow Spokane’s bicycle culture from niche to mainstream. And that’s something that could benefit us all, through a more active streetscape and a greater availability of alternative commuting options. SHARE YOUR THOUGHTS: What do you think? Would a bikeshare system work in Spokane? Where would you like to see a station? Do you see bikeshare as a viable option for commuting, or more of an alternative for tourists and convention guests? Share your thoughts in the comments below, on Facebook, on Twitter, or in person. We love to hear from you! Right now, if you go out on a Friday or Saturday night in downtown Spokane, you have relatively few decent transportation options at your disposal. While most bars close at 2am, STA service ends at 11pm, leaving you with the difficult choice between an expensive taxi/Uber/Lyft and a designated driver. That discourages people from going out, especially considering the hassles associated with parking and choosing a designated driver. The simple fix? Night buses on STA. Such a system could model itself after similar successful programs in Europe, which have reduced traffic deaths and DUIs and increased economic activity. While London manages a large-scale night-time operation (and will soon introduce 24-hour Tube service on select lines), smaller cities (like Freiburg, Germany, where I lived last fall) make use of a more streamlined shuttle-esque model with a fixed route and the same starting point for all routes. Spokane could learn a lot from these systems as it works to develop extended weekend service. Simple routes. All routes could start at the STA Plaza, for simplicity and convenience. Limit stops and use park and rides and transit centers as terminuses. Consider two north routes (including via Gonzaga University), a South Hill route (via Browne’s Addition), and a Valley route, at the bare minimum. Don’t do pickups; this is outbound service for those out downtown Friday and Saturday late nights. Simple timetables. Assuming this service would be operated mostly on Friday and Saturday nights, cater to the audience. Make the departure times super simple. All routes could leave the STA Plaza at the same time. Use easy-to-remember departure times. In Freiburg, the five night bus routes left the Central Train Station at 11:11pm, 12:12am, 1:11am, 2:22am, 3:33am, and 4:44am. Spokane could use a variation of this model. Simple fares. To simplify the fare structure, charge a $5 flat rate for everyone, regardless of whether or not they have a monthly or daily pass. This further separates nighttime service from daytime commuter service. Simple connections, if necessary. Last-mile connections to taxis or Uber/Lyft drivers should be made as uncomplicated as possible; allow these operators to create a stand in park and ride/transit center lots. Sure, Spokane isn’t Europe. But we do have a strong downtown late-night scene, especially in the Globe/Borracho/Nyne/Zola area. A super-simple night bus would allow these revelers to enjoy the night a bit longer and hopefully reduce instances of DUI. It would also be cheaper than a more complicated solution, and would offer far better fare recovery for STA. And what better way to introduce improved service than with one that would be so easy to use? SHARE YOUR THOUGHTS: Would you use such a “night bus” system as described here? What holds you back from going downtown on a Friday or Saturday night? Would better nighttime transportation make it easier for you? What’s your vision for the future of later service on STA? Share your thoughts below in the comments, on Facebook, and on Twitter. We love to hear from you! POST-MORTEM: Who killed Proposition 1? Proposition 1 was a reasonable, balanced transit package that funded system improvements across the STA network. It eschewed big projects in favor of smaller-scaled, bus-centric investments, and it sunset after ten years in order to give voters a sense of accountability over the small 0.1% sales tax hike. So why did it fail? Several theories have been floated in the past few weeks, and I think that I might have a few answers. THEORY #1: The “Yes” campaign did not sell the package strongly enough to people who don’t regularly use transit. It’s clear that the “yes” campaign did not do a strong enough job of selling the measure to those who do not regularly use transit in the Spokane area. Instead, a large emphasis was placed on the “elderly, low-income, and disabled” riders who currently avail themselves of STA services. That’s great, and transit is certainly important for those groups. But what about everyone else? Certainly there would be benefits for everyone else? Consider that perhaps advertising for the “yes” campaign should have emphasized that Proposition 1 would make transit available for more people, including the middle-class and wealthy, giving even those groups the ability to use transit. Perhaps ads should have focused on the traffic reductions that strong transit service can bring. Many drivers in Indian Trail, Five Mile, and the Moran Prairie have noticed wildly increased commute times, especially during the mornings, as new residential and commercial developments have been approved. Numerous WSDOT and federal studies have found that traffic congestion in the Spokane-Coeur d’Alene metropolitan area is set to double by 2030 as the population grows and streets and freeways struggle to pick up the slack. Sell transit to traffic-minded drivers! Transit means reduced traffic congestion. Moreover, by connecting transit to the ongoing talks about urban expansion in the Spokane area, a better conversation would have been started about the issues that lead to traffic in the first place. All of these issues are connected, and it felt at times like the “Yes for Buses” campaign neglected to drive this narrative home with voters. THEORY #2: The package was too timid, meaning that voters could not distinguish the difference between current STA service and promised future service under Proposition 1. This certainly applies to some individuals who see the benefits of transit but did not see real improvements in the STA system. And this could be either a fault of the STA Moving Forward plan or a fault of the advertising in the Yes for Buses campaign. By the end of 2014, the original proposal for the Central City Line, a streetcar, had been scaled back to a battery electric bus, for example. Well, what’s the improvement in terms of comfort or service of a battery electric bus? Not much. Certainly the streetcar proposal would have had a greater “distinction” factor that would have clearly offered a contrast with existing service. Some have even called for a resurrection of the South Valley Corridor light rail plan. And overwhelming 2014 passage of the Riverfront Park Bond proves that area voters are willing to spend money on flagship projects. On the other hand, perhaps voters simply didn’t see how the package would benefit them. What would the sales tax increase mean functionally for me as a young person, for example? Easy. New weekend bus service would allow a Gonzaga University student to catch a bus back to campus as late as 1am or 2am. That’s far cheaper than shelling out cash for a Lyft or Uber ride. And that’s just one example. We could also talk about a high-performance line on from South Regal to North Monroe or the West Plains Transit Center. Either one would have produced material benefits to riders, but they weren’t the focus of the “yes” campaign’s advertising. THEORY #3: Uncertainty and misinformation from elected officials (especially David Condon and the Board of County Commissioners) and local media (especially the Spokesman-Review and local TV stations) contributed to lack of public understanding of the measure. Finally, outside of the Spokane City Council, most area elected officials were lukewarm at best on the proposal. Al French of the Board of County Commissioners was famously in favor, but his compatriots were less sympathetic. Spokane Valley officials decried the proposal. And David Condon was absent from the debate altogether, which certainly should become a campaign issue this fall as he looks toward re-election. In the media, the proposal faced sharply negative billing. The Cowles-owned Spokesman released a negative editorial, and KHQ started trashing/editorializing on the Central City Line almost a year before the package hit the ballot. Other news outlets were slightly less critical, but failed to properly print facts, often conflating the Central City Line with the larger Proposition 1 package, despite its relatively small $17 million appropriation as part of the measure. Sometimes the modern electric trolleybus or streetcar study renderings were used as part of reports, despite the fact that they had been eschewed in favor of the battery electric bus. One breathless KHQ report even called the Central City Line a “light rail” system. Of course, this attracted the ire of conservatives and confused even more independent-minded voters. It is clear that Proposition 1 failed largely as a result of ineffective campaign tactics on the part of Yes for Buses, but also due to its confusing lack of distinction from existing service and an absence of support from more conservative elected officials and editorial boards. Hopefully the proposal can be resurrected in the future, perhaps as a Spokane-only package a la Seattle’s similar arrangement to essentially “purchase” bus service from King County Metro within its city limits. In the meantime, we await an appropriate solution. SHARE YOUR THOUGHTS: What do you think caused Proposition 1 to fail at the polls in the Special Election? Are voters tax-weary? Was the package improperly or incorrectly sold to the public? Did lack of public official support create a vacuum for conservatives to pounce? We love to hear your thoughts. Be sure to share your ideas, thoughts, and concerns below in our comments section, on Twitter, on Facebook, or in person. We love to hear from you. There’s been a lot of controversy over the past week or so surrounding Proposition 1 and the Central City Line. The Spokesman-Review just yesterday wrote a frankly somewhat schizophrenic editorial urging voters to reject the funding package but support improvements in bus services. (This despite the fact that rejection of the package would result in massive service cuts.) While we don’t take positions on ballot measures, we can’t help but feel that most of the coverage surrounding the Central City Line has neglected or mischaracterized key details. Our primary point? The Central City Line is an improvement over existing service, but deserves neither hype nor criticism. While the CCL will certainly improve circulation, increase frequency, and solve criticisms of the STA Plaza, it is at its core a flawed, relatively timid proposal which will not generate a significant economic impact. We’re always saying that in order to succeed, Spokane needs to take time and energy to attract a key demographic: young, urban professionals. But what does it take to do that? Millennials are markedly different from their parents in a number of ways, from dress to music to cultural attitudes. But perhaps most tellingly, millennials desire different things from their homes. Where the Baby Boomers originally valued safe, affordable homes in the suburbs, research reveals that more and more millennials wish to live in the type of mixed-use communities that Spokane needs to succeed. According to new data reported by The Atlantic CityLab, these young people are primarily concerned with four issues: walkability, good schools and parks, excellent public transportation, and new technology. Sound familiar? We’ve been advocating these causes for months. Unfortunately, it seems that Spokane currently caters more toward Baby Boomers than to Millennials. Our development policies favor large, suburban tracts on the urban fringe, as opposed to live-work communities like Kendall Yards. Public transportation and bicyclists constantly deal with the scorn of those who believe more money should be spent on roads. And while our schools continue to improve, they are not making the type of calculated investments needed to take area education to the next level. So let’s invest. Let’s build a streetcar, a trolley, a light rail. Let’s improve our bike lanes, our crosswalks, our pedestrian trails. Let’s incentivize infill, and work with developers to craft creative plans for increasing density. Let’s make sure our schools have the proper tools to teach, from smaller class sizes to new curricula and learning methodologies. Let’s bring entrepreneurship and innovation to the high schools, the middle schools, and even the elementary schools, encouraging students and fostering a culture of creativity. Let’s improve Riverfront Park, adding new features for accessibility and new community gathering places under the Pavilion. Let’s create a city-wide fiber-to-the-home initiative, bolstered by the local business community. These investments have tangible returns and have proven to show real-world results. With them, we could become the number one city in the country for millennials. Seriously. Let’s take some time to make this happen. Investment first. Then returns. That should be the strategy moving forward. What do you think? What could the Spokane area be doing to attract more millennials? How do you think our policies line up with the perspectives of millennials? How could we become the #1 city in America for millennials? Share your thoughts on Facebook, on Twitter, in the comments below, or in person. We love to hear from you.